When I was about twenty, I stumbled upon the book The Dancing Wu-Li Masters by Gary Zukav. The book provides a non-mathematical introduction to the concepts of quantum mechanics, which is good, I suppose; but then it attempts to tie it to Eastern mysticism, which is troubling to anyone who actually understands the science. First published in 1975, The Tao of Physics rode the wave of fascination in exotic East Asian philosophies. Decades later, it still stands up to scrutiny, explicating not only Eastern philosophies but also how modern physics forces us into conceptions that have remarkable parallels... (T)he big picture is enough to see the value in them of experiential knowledge, the limits of objectivity, the absence of foundational matter, the interrelation of all things and events, and the fact that process is primary, not things. Capra finds the same notions in modern physics. In part, I'm sure my positive reaction to these books was because I was in the middle of actually taking a class in quantum mechanics, and it was, to put not too fine a point on it, freakin' hard. I had thought of myself all along as quick at math, but the math required for this class was brain-bendingly difficult. It was a relief to escape into the less rigorous world of Capra and Zukav. (B)eing closed loops, (they) imply the presence of diverging integrals having no mathematical meaning. To overcome this difficulty, a technique called renormalization has been devised, producing finite results in very close agreement with experiments. It is important to note that a criterion for theory being meaningful after renormalization is that the number of diverging diagrams is finite. In this case the theory is said to be renormalizable. The reason for this is that to get observables renormalized one needs a finite number of constants to maintain the predictive value of the theory untouched. This is exactly the case of quantum electrodynamics displaying just three diverging diagrams. This procedure gives observables in very close agreement with experiment as seen, e.g. for electron gyromagnetic ratio. Modern physics has thus revealed that every subatomic particle not only performs an energy dance, but also is an energy dance; a pulsating process of creation and destruction. The dance of Shiva is the dancing universe, the ceaseless flow of energy going through an infinite variety of patterns that melt into one another. 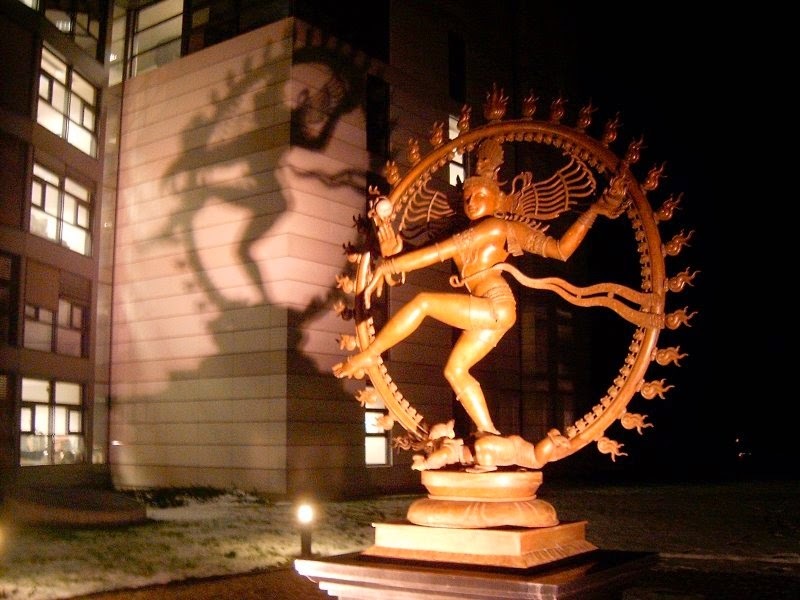 For the modern physicists, then Shiva’s dance is the dance of subatomic matter. As in Hindu mythology, it is a continual dance of creation and destruction involving the whole cosmos; the basis of all existence and of all natural phenomenon. Hundreds of years ago, Indian artists created visual images of dancing Shivas in a beautiful series of bronzes. In our times, physicists have used the most advanced technology to portray the patterns of the cosmic dance. It all sounds nice, doesn't it? No need for hard words like "renormalization" and "gyromagnetic ratio," no messy mathematics. Just imagining particles dancing, waving around their four little quantum arms, just like Shiva. The problem here, though, isn't just laziness; and I've commented on the laziness inherent in the woo-woo movement often enough that I don't need to write about it further. But there's a second issue, one often overlooked by laypeople, and that is "mistaking analogy for reality." Okay, I'll go so far as to say that the verbal descriptions of quantum mechanics sound like some of the "everything that happens influences everyone, all the time" stuff from Buddhism and Hinduism -- the interconnectedness of all, a concept that is explained in the beautiful allegory of "Indra's Net:"
Far away in the heavenly abode of the great god Indra, there is a wonderful net which has been hung by some cunning artificer in such a manner that it stretches out infinitely in all directions. In accordance with the extravagant tastes of deities, the artificer has hung a single glittering jewel in each "eye" of the net, and since the net itself is infinite in dimension, the jewels are infinite in number. There hang the jewels, glittering like stars in the first magnitude, a wonderful sight to behold. If we now arbitrarily select one of these jewels for inspection and look closely at it, we will discover that in its polished surface there are reflected all the other jewels in the net, infinite in number. Not only that, but each of the jewels reflected in this one jewel is also reflecting all the other jewels, so that there is an infinite reflecting process occurring. But does this mean what some have claimed, that the Hindus discovered the underlying tenets of quantum mechanics millennia ago? Hardly. Just because two ideas have some similarities doesn't mean that they are, at their basis, saying the same thing. You could say that Hinduism has some parallels to quantum mechanics -- parallels that I would argue are accidental, and not really all that persuasive when you dig into them more deeply. But those parallels don't mean that Hinduism as a whole is true, or that the mystics who devised it were somehow prescient. In a way, we science teachers are at fault for this, because so many of us teach by analogy. I do it all the time: antibodies are like cellular trash tags; enzyme/substrate interactions are like keys and locks; the Krebs cycle is like a merry-go-round where two kids get on at each turn and two kids get off. And hopefully, our analogies are transparent enough that no one comes away with the impression that they are describing what is really happening. I have yet to see a student begin an essay on the Krebs cycle by talking about merry-go-rounds and children. The line gets blurred, though, when the reality is so odd, and the actual description of it (i.e. the mathematics) so abstruse, that most non-scientists can't really wrap their brain around it. Then there is a real danger of substituting a metaphor for the truth. It's not helped by persuasive, charismatic writers like Capra and Zukav, nor the efforts of True Believers to cast the science as supporting their religious ideas, because it helps to prop up their own worldview (you can read an especially egregious example of this here). After a time in my twenties when I was seduced by pretty allegories, I finally came to the conclusion that the reality was better -- and, in its own way, breathtakingly beautiful. Take the time to learn what the science actually says, and I think you'll find it a damnsight more interesting and elegant than Shiva and Indra and the rest of 'em. And best of all: it's actually true.